Before Matt could follow her inside, his phone rang again. He remained outside, listening in silence. When he finally stepped into the cabin, he crossed to the kitchen and began filling a box with food containers. Hearing the sound of a truck’s engine, she started past him. As her body brushed against his, she felt a sudden, shocking sexual jolt. She paused for a mere moment, tipping her face up to his, her eyes wide, her breath catching in her throat. Something in the way she said it had him looking from her mouth to her eyes. Alarmed that he could read her thoughts, she blindly reached a hand to the door, only to have her hand coming in contact with his. She pulled it away as though burned, but it was too late. The rush of heat had her cheeks going bright pink. She looked up to see him watching her in that quiet, closed way. Before she had a chance to think what she was doing she stood on tip-toe and brushed his mouth with a soft, butterfly kiss as light as a snowflake. His eyes narrowed. His hands gripped her shoulders and for a moment he hesitated, as though considering. Then he lowered his head, staring into her eyes before covering her lips with his. I really enjoyed this read – and it definitely holds great promise for the new series too. The vast Montana scenery and lifestyle adds an element of both wildness, but also freedom to the setting – and makes the plot twists achievable. The Malloys are people who fall in love almost instantly when they find the right person – yet there are four bachelor men currently unattached. Matt is the first one to fall, and we follow his progress with both drama attached, but also with some really quiet, reflective sharing moments. I liked the family times, and the cook's story being shared – his amazing skills as a chef made me hungry. 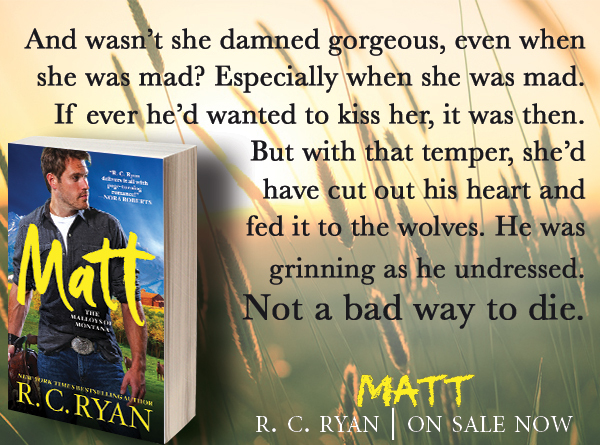 There were a few places where I wasn't convinced that the complexity of the plot was necessary, as the love story was doing fine on its own – but it was a good read, and I look forward to reading Luke's story, which is previewed at the end of the book. 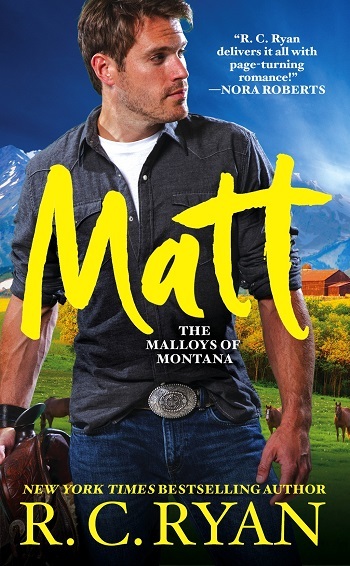 Reviewers on the Wicked Reads Review Team were provided a free copy of Matt (Malloys of Montana #1) by R.C. Ryan to read and review for this tour.